Although you usually use the Go To feature in Excel 2016 to move the cell cursor to a new cell in the worksheet, you can also use this feature to select a range of cells. 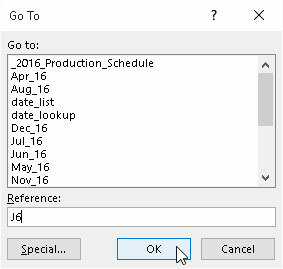 When you choose the Go To option from the Find & Select button’s drop-down menu on the Home tab of the Ribbon (or press Ctrl+G or F5), Excel displays a Go To dialog box similar to the one shown. Selecting a cell range with the Go To dialog box. Select the first cell of the range. This becomes the active cell to which the cell range is anchored. On the Ribbon, click the Find & Select command button in the Editing group on the Home tab and then choose Go To from its drop-down menu or press Alt+HFDG, Ctrl+G or F5. The Go To dialog box opens. Type the cell address of the last cell in the range in the Reference text box. If this address is already listed in the Go To list box, you can enter this address in the text box by clicking it in the list box. Hold down the Shift key as you click OK or press Enter to close the Go To dialog box. By holding down Shift as you click OK or press Enter, you select the range between the active cell and the cell whose address you specified in the Reference text box. Instead of selecting the anchor cell and then specifying the last cell of a range in the Reference text box of the Go To dialog box, you can also select a range simply by typing in the address of the cell range in the Reference text box. Remember that when you type a range address, you enter the cell reference of the first (active) cell and the last cell in the range separated by a colon. For example, to select the cell range that extends from cell B2 to G10 in the worksheet, you would type the range address B2:G10 in the Reference text box before clicking OK or pressing Enter.